Like the Nürburgring and Le Mans circuits, which also ran on public roads, Spa became notorious for fatal accidents, as there were many deaths each year at the ultra-high-speed track. At the 1960 Belgian Grand Prix, two drivers, Chris Bristow and Alan Stacey, were both killed within 15 minutes (although Stacey's accident was caused by a bird hitting him in the face) and Stirling Moss had crashed at Burnenville during practice and was severely injured. When Armco crash barriers were added to the track in 1970, deaths became less frequent, but the track was still notorious for other factors. The Ardennes forest had very unpredictable weather and there were parts where it was raining and the track was wet, and other parts where the sun was shining and the track was completely dry. This factor was a commonality on long circuits, but the unpredictable weather at Spa, combined with the fact that it was a track with all but one corner being high-speed, made it one of the most dangerous race tracks in the world (if not the most). As a result, the Formula 1 and motorcycle Grands Prix and 1000 km sportscar races saw smaller than usual fields at Spa because most drivers and riders feared the circuit and did not like racing there. Multiple fatalities during the 1973 and 1975 24 Hours of Spa touring car races more or less sealed the old circuit's fate, and by 1978, the last year Spa was in its original form, the only major races held there were the Belgian motorcycle Grand Prix and the Spa 24 Hours touring car race; the 1000 km World Sportscar Championship race no longer took place after 1975 and did not come back until 1982. The Masta Kink "was by far the most difficult corner in the world", according to Jackie Stewart, requiring skill and bravery in equal measure to get it right. After a long run from Malmedy, the cars would reach top speed before having to negotiate Masta, a high speed left-right chicane, and a good exit speed was vital as it was followed by another long straight run to Stavelot. This was a very fast and very dangerous corner, as it was situated right in the middle of two long unbroken straights, both about 1½ miles (2.4 km) long. The speed in this sector could reach 190 mph (305 km/h). 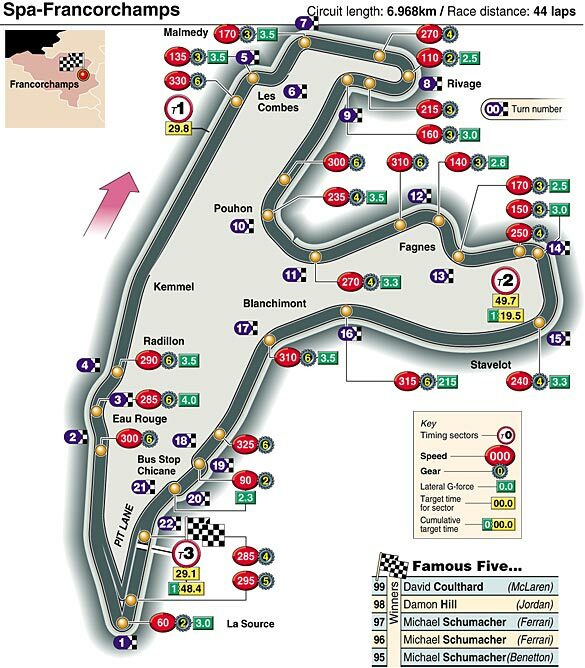 The most famous part of the circuit is the Eau Rouge and Raidillon combination. Having negotiated the La Source hairpin, drivers race down a straight to the point where the track crosses the Eau Rouge stream for the first time, before being launched steeply uphill into a sweeping left-right-left series of corners with a blind summit. Properly speaking, the Eau Rouge corner is only the left-hander at the bottom. The following right-hander that leads steeply uphill, which was introduced in 1939 to shortcut the original Ancienne Douane hairpin, is called Raidillon [fr]. The corner requires an amount of skill from the driver to negotiate it well and the long Kemmel straight ahead produces good overtaking opportunities for drivers at the following "Les Combes" corner. The corner was tighter and narrower (it was made wider in 1970, when the circuit was updated) on the old circuit than it is today, allowing drivers to take the corner faster. This page was last edited on 24 April 2019, at 21:02 (UTC).